October 2012 | Virgin America, probably the most tech-savvy airline in the industry, plans to revolutionise its approach to customer service. Next year the airline will further upgrade its already advanced RED IFE system with a service built on Salesforce.com’s Chatter social messaging tool. This will allow passengers to interact with the carrier via the entertainment screens on the back of seats during the flight to deal with “real-time problems that need real-time answers”, according to the airline’s CEO David Cush. Virgin America already allows passengers to message each other during a flight, but with Chatter they will also be able to interact with Virgin America support staff on the ground. 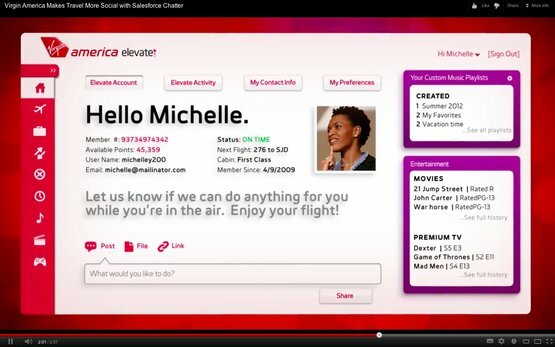 A Salesforce.com-based CRM dashboard provides Virgin America customer service agents with information about each customer’s last three interactions on social media and their flight history, which allows them to send a targeted message. For example, a customer tweeting about being worried about missing a flight will be served up a response via Chatter on the screen in front of their seat with information on how they can make their next connection. Customer service personnel on the ground could also take pro-active action to alert a passenger to a potential problem, such as a bag not having made it on the flight, through a pop-up alert on the screen. Passengers, meanwhile, will find a personalized environment on their IFE system. For example, Virgin America is looking to not just give passengers details about their frequent flyer points, but also suggest entertainment and food & beverage choices on what they have watched before or eaten on previous trips, as well as airport maps of where they go to make connecting flights. The system also gives all passengers brief profiles on other passengers as a conversation starter for the seat-to-seat chat function. Furthermore, passengers can contact Virgin America’s customer service staff via the IFE system to ask if they have been upgraded on the next leg of their travel and get quick feedback. When watching a movie, the IFE screen will signal passengers that they have received a notification from the airline. A video of the new Chatter features is available here, while this video (start at 6min45) includes a mockup of the seat-back app currently in development. Virgin America calls its new Chatter functionality an example of contextual computing. The airline shows that it knows who passengers are, where they are seated, what they need right now and what they may need next. Virgin America also wants to use Chatter to revolutionise internal communications as it looks to break down silos in what traditionally has been a hierarchical industry. For example, customer service agents, recognizing that a high-value customer might be in danger of missing a tight connection, relay an alert ahead to airport staff with a custom map showing the passenger exactly how to get most efficiently from his arrival gate to the departure gate. A gate agent could then be holding up an iPad displaying that that map, with the customer’s face on it, as he walked off the plane, to point him in the right direction.